Now that I have been home for a little over a week and having recovered almost 100%, I am still having trouble grasping all that went on during this MLO! What God allowed us to do and the open doors of developing relationships during those 10 days was mind blowing and I am still trying to grasp it all! I have been in tears several nights when thinking about it and explaining to my bride God's hand working through it all. I wanted to update you on a couple of things, clarify something from the last blog I sent and to share with you two emails we have received since returning. March MLO: Mission Comes to an End, But the Learning and Opportunities continue! From the chance for our hockey coaches to share their life stories to my opportunity to share my testimony, God uses those situations to soften hearts and create open discussions. From coaches requesting more baseball devotional books to others asking if they could take more Sports Bibles, God will use the written Word to share His story! Well, most of the team has made it back to their homes but five remain at HiS HOUSE (flying out today) and two are stranded with me in Frankfurt, Germany! The Mission may be over, but the Learning and Opportunity continue from this day forward! March MLO - Riding a God-Sized Wave of Gratitude and Blessings! What God did, the people He used to do it with and the blessing we had to share with those who came was the best wave a surfer dreams of having the chance to ride! I make that analogy only because of our California contingent who joined the HiS PRINT Team this time! 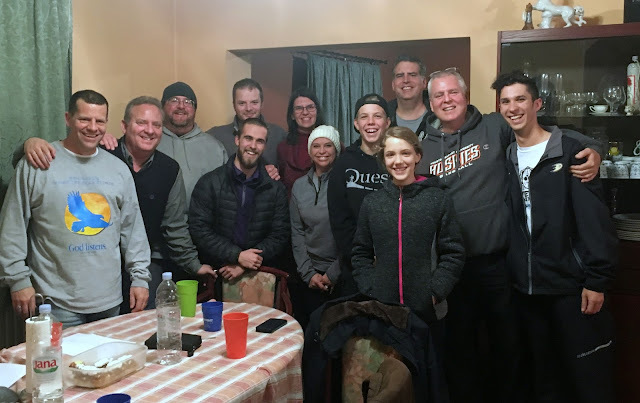 With those 6 team members from the great state of California, our northern partner from Wisconsin and our brother from Germany, we were blessed to share Christ from more than just Texas! 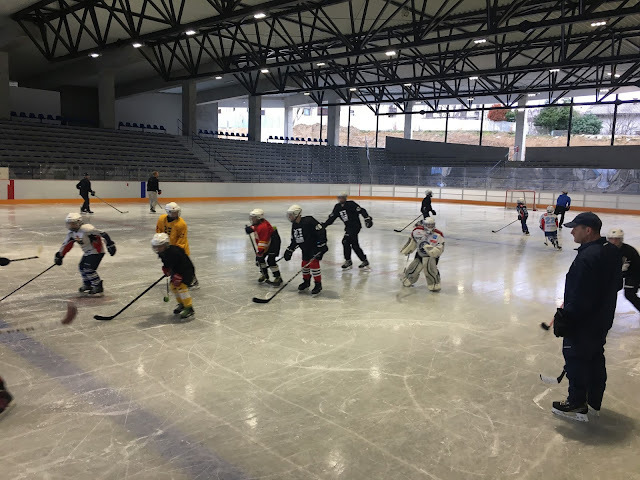 The hockey camp was a huge success and our coaches were invited back for future opportunities. The baseball coaches remained at HiS HOUSE well after the clinic was complete, just to spend time together! Developing new relationships and establishing deeper ones from previous years is the reason we come these 6,000+ miles! God opens, calls and guides us to those He desires us to share with. Here are just two examples of those who were grateful we came! March MLO Day 8: Mission Leaning Opportunity - God is God! God is a big, big God and He’s a God of might, love and grace, as well as surprises! Nothing is a surprise to Him, but He sure can pull a fast one you in more ways than one! Our hectic, fast-paced, blessed schedule has prevented me from writing updates the last couple of days, and now that so much has transpired it's really hard to put my thoughts into words! Thursday was a flurry of activity with the start of Hockey Camp, Intentional Walk Baseball Coaches Clinic and sorting of the equipment at the warehouse for distribution to both! It was "pedal to the medal" for everyone! Over 40 players attended the Hockey Camp and 43 coaches came for the Baseball Coaches Clinic. It was a blessing to share with each one of them! Wow what 7 days make, not just a week, but action packed, non-stop activity! On Wednesday, while the business seminar was going on, we had a crew working on organizing the 14,000 pounds of equipment at the warehouse! And boy did they work and organize! All the rest of the baseball and hockey equipment was separated, sorted and organized for distribution across the region. It almost feels like you are at Walmart. We even have a map on the wall to show you where everything is! Open doors and opportunities to share His love through equioment can now continue! Praise God! March MLO Day 6: Picture is Worth a 1,000 Words! Picture is Worth a 1,000 Words! And No Words could Describe! Those two thoughts are running through my mind as I try to place my thoughts around all that God is doing! This picture was taken Wednesday night from our HiS HOUSE back patio and it is indeed worth a thousand words. Yet all those words wouldn’t begin to adequately describe the beauty it has and the majesty it possesses. All words placed together would pale in comparison to the masterpiece it is! That is exactly how I feel as I try and translate into words what transpired here these last two days! Not because it has been any more miraculous than the previous 6 days, but because I’ve used up all the words already that can best describe what God is doing and I sound like a broken record! Tuesday was another wonderful day of community outreach! Our team visited a local elementary school and presented a sports program for over 125 children from the 3rd, 4th and 5th grades. 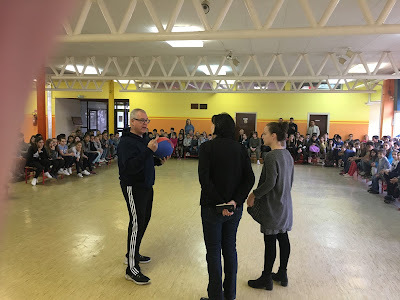 The presentations of American football, ice and roller hockey and baseball were wonderful and the children all wanted to participate. Everyone had a blast! The last of our 20 team members arrived today and we are excited about the upcoming events. If you're interested in coming, it’s not to late! Fly into Zagreb Croatia and we will arrange to pick you up! Monday was a day of recovery from the weekend flurry of activities with the Extra Point Football Clinic. Sleeping in was a popular activity! After allowing time for an adequate amount of shut eye, we gathered together and had a beautiful time of prayer, devotions and fellowship. 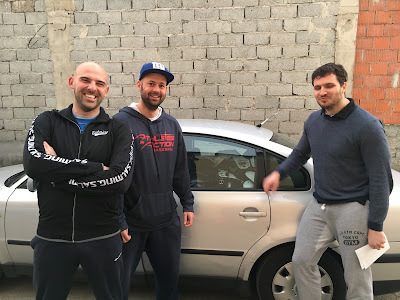 Then we headed out to the food pantry to deliver food to less fortunate people in and around Sisak. 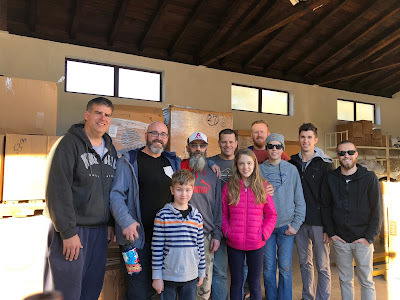 We were able to pray and deliver food to 10 families and wow, what a blessing this experience was again! 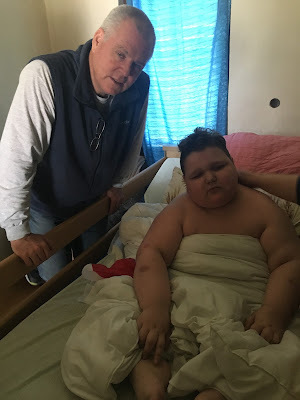 The picture below is of me with a young boy named David. David has been left blind and unable to walk since he was diagnosed with a brain tumor at age 4. I was also blessed with the opportunity for Mark Hull and I to be invited to come and look at the city of Sisak’s wrestling club! That was totally a God thing and I wish I had the time to go into complete detail as to how this all came about and how God designed all of it through Devine appointments. Later! HE DID IT! Let's Do IT! MARCH MLO Day 3: Moving Forward By Walking IT OUT! What a remarkable day of activities that were fast and furious, but the day can best be described as a day of discovery! The discovery was in such a wide variety of ways that it’s hard to really place down in words, but to witness all that occurred during this day goes way beyond the sport of football. Just in this past tweny-four hours the 78 coaches and 13 team members have witnessed new discoveries and new possibilities! March MLO Day 1: Do You Believe? There are thirteen HiS PRINT Team members on the ground presently in Sisak, Croatia and nine more on the way over the next 72 hours. The team is coming together to help administer His plan over the next ten days in six different ministry opportunities! God put together a team of warriors including coaches, teachers, college professors, business owners, businessmen and athletic trainers from Texas, California, Wisconsin and Germany all with one common denominator: Jesus Christ and His call to come alongside HiS PRINT and share His love! "Lisa and Mike Norman and myself have been bumped from our flight to Croatia. We have made different arrangements and are getting rerouted through Amsterdam, but our luggage is still on the plane to Boston. It was already loaded and we were told they wouldn’t pull it. Mike and I prayed right then and there and would now like to ask the prayer warriors to join us! We wrote those plans in pencil and handed God the eraser. He obviously had other plans! HiS PRINT Spring MLO Begins Today! Today marks the day that we head out for our spring MiLO over to Croatia to lead a bundle of ministry opportunities! 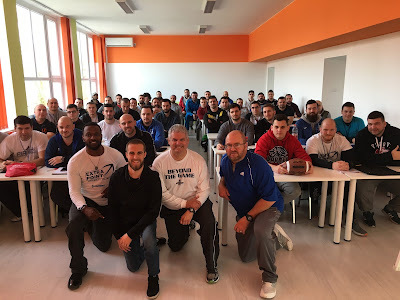 We have 22 people heading to Sisak, Croatia from all over the United States as well as places in Europe to come help HiS PRINT minister through Football Coaches Clinic, Baseball Coaches Clinic, Praying and Delivering Food with the Food Pantry, Elementary School Program to introduce American Sports, Business Seminar with local business owners and CEO's and Hockey Camp. And we are doing all this in 9 days! God has created this awesome opportunity to declare His name and share His love! Please pray for safe travels and energy to share with all those He will be bringing from all over The Balkans! The football clinic has over 100 participants and has become the largest coaches clinic on European soil! 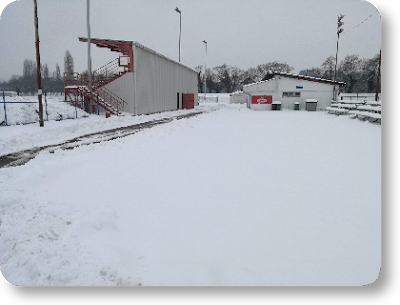 Please pray for great weather and clearing of the snow so we can participate outdoors for the clinics.